TECHNIQUE JUNKIES 2nd TREASURE HUNT! Hello! Welcome to the second Technique Junkies Blog Hop! Last month, I said we would host these Treasure Hunts every 3rd week, but I was incorrect - it will be the last Monday of every month. I apologize for the error. In the process of going from Blog to Blog you will want to collect small treasures! At the end of the treasure hunt, put the collection together to see what it says and follow Pat’s directions to have an opportunity to win a FABULOUS treasure chest filled with prizes! 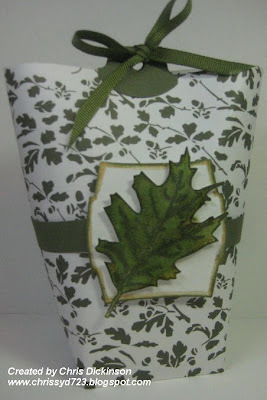 This project gives you a SNEAK PEEK to the Technique "BAG IN A BOX". 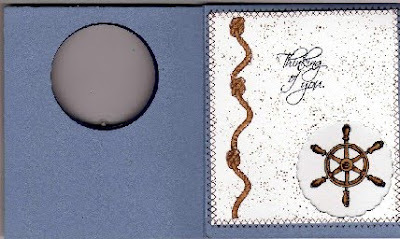 The technique instructions are available in the Technique Junkies Newsletter CD7! This CD has 100 different techniques. You can find out information to pre-order this. If you are not a subscriber, I really must encourage to become one! Each newsletter is better and better with step by step directions (with pictures!) on how to use these WONDERFUL techniques! Copics are available at Croppinsville, they have a small town service with a big city selection with a great variety of product in their store. The treasure you will find here is the letter "I". For your next CLUE to the TREASURE HUNT go to Jane's Blog to collect another treasure! Have fun hunting for your treasure! 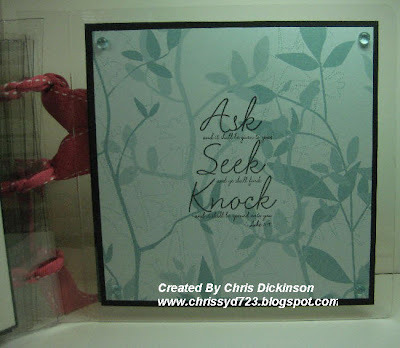 The Treasure Hunt is coming - and a Blog Hop too! 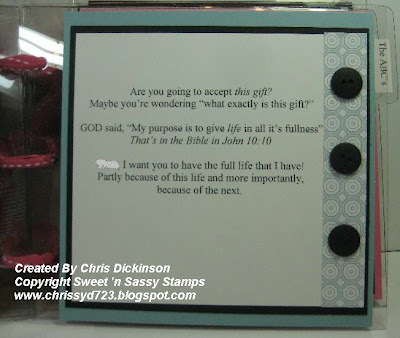 Now...there is ANOTHER BLOG HOP with Sweet 'n Sassy Stamps! Join us for a Mini-Release Blog Hop Tuesday, September 1st. You're gonna love our new stamps!! We will see you soon! Have a great day! Today is SWEET STOP Sketch Saturday! I love these sketches because they are so fun and easy! Not too complicated! :) Nothing better than that. It gives you a great start to creativity. Today, I am off to church for training. We are starting up the AWANA program at our church this year. My children have been involved in AWANA for years, so I am VERY excited about the new program starting up at the church we call "home." I used the Technique Junkies technique, Textured Spectrum. I hated to cover up the background I created because it looked so pretty, but the sketch didn't lend itself to showing off more of the background...I will have to make another one that will SHOW more of this background. 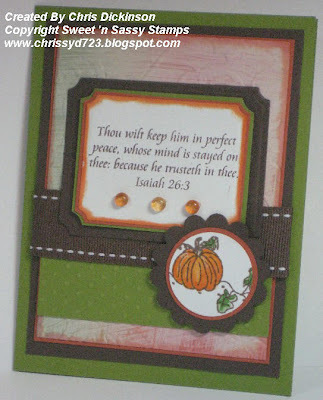 Fall is my FAVORITE time of year, so as I was looking through my stamps, I grabbed fall colors and fall images! 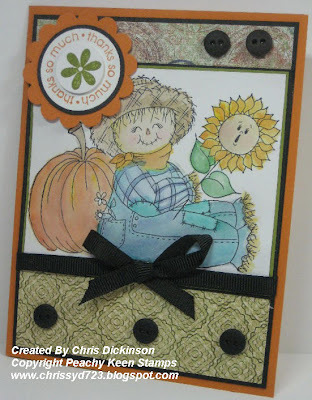 You can see MORE Fall stamps available at Sweet 'n Sassy Stamps here. 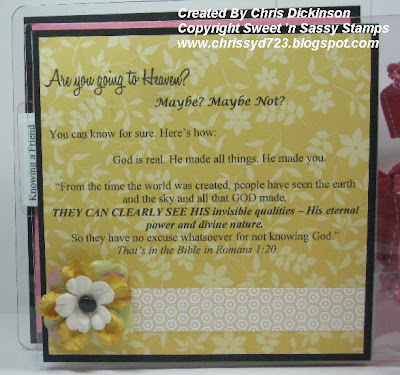 The stamp sets I used are called HAPPY HARVEST and TRUST IN THE LORD. 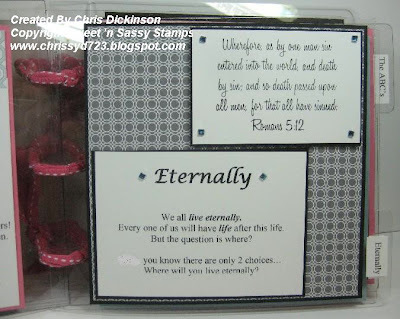 There are also lots of Scripture stamps too! Hope you have a great day!!! Thank you for stopping by!!! Hello! 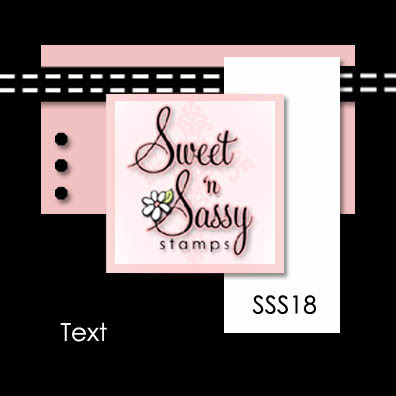 Welcome to the BLOG HOP for Sweet 'n Sassy Stamps! If you came here first, you will want to swing to Deedee Anderson's blog to start at the beginning of the BLOG HOP! 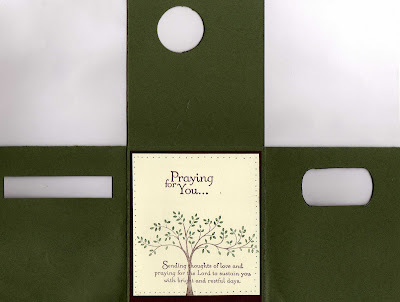 This BLOG HOP is so special because all of the Design Team is using SCRIPTURE. 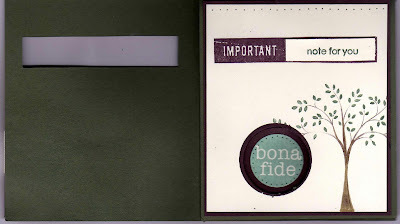 About 3 years ago, a very special person named Sharon made an album for another friend of mine that was similar to this. 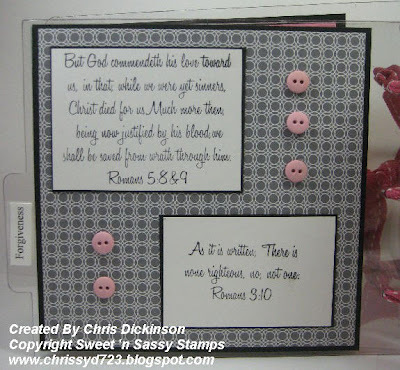 That inspired me to make this album...so as soon as Korin said we are having this blog hop showcasing the Scripture sets, I knew exactly what I wanted to create. 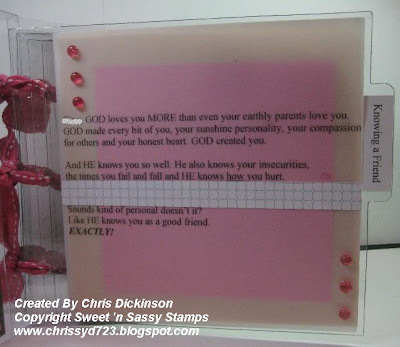 For this project, I typed most of it, but many of the Scriptures come from Sweet 'n Sassy Stamps. 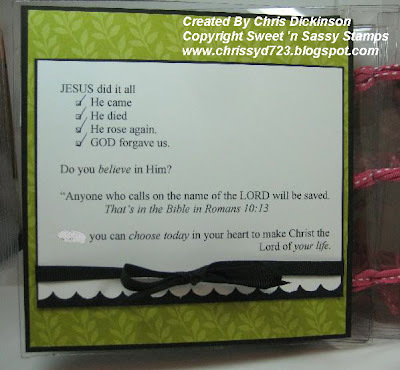 I used the Romans Road stamp set. The Acrylic Album -comes from Creative Cuts and More. The acetate is .020 gauge thickness.which is a niceheavy thickness. The acetate is covered with film,which needs to be removed before assembling album. They also have an AWESOME price on their Killer Red Sticky Tape!!! I used that to help assemble this album! 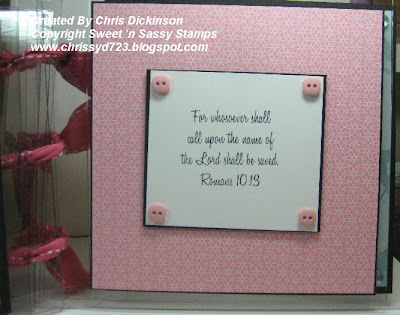 Stamps: Sweet 'n Sassy Stamps, Romans Road and Alphablocks Digi Image. 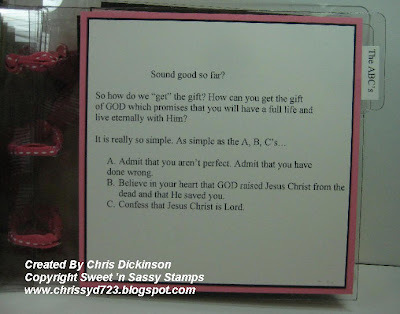 I loved how Sandy put it on her blog post yesterday... One of the sweetest and dearest memories we have should be the day we accepted Jesus as our Saviour. If Jesus came back today or something were to happen, are you 100% sure you would go to Heaven? If not, e-mail me at chrissyd723@gmail.com and let's get that settled! From here you will want to go to see the eye candy at SNSS Blog featuring Michele Kovack!!! She always creates something that I LOVE!!! As a child, I grew up in a dysfunctional home. I was physically and sexually abused from the time I was 5 yrs. old, until I was 14 years old by my step-father and six other men on different occasions. When I was 14, we had a neighbor friend come out with some abuse that was happening in her life. It was at that time I told my mother. I grew up with the fear and lack of respect for myself and for men. However, I always envisioned that my birth father or someone could come and save me from what I was enduring at the time. It was during that time, that my neighbor spoke of her abuse that I broke down and told my mom. I hated the abuse at the hand of my step-father, yet felt guilty because he was the only daddy that I ever knew. I had so many emotions, I could not even begin to describe at the time. I felt guilty, confused, and even had much self hatred because he went to jail for the next year. I thought it was my fault. I often questioned GOD and would sit and cry for hours asking WHY ME? I had a younger sister, who was my step-father’s child from birth with my mother, and all of my childhood, I felt she resented me because he had gone to prison. I felt like I was such a bad person, that I deserved much of what was happening to me. That same year, my mom started attending a Bible Church. One week there was a Tent Revival, with a speaker in a town nearby, so we went. 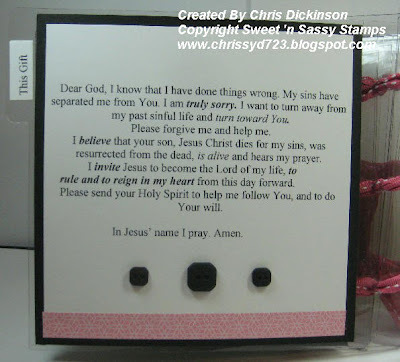 That evening my mom made a commitment and accepted Jesus as her personal Savior. At the same time, I professed to accept the Lord as my Savior too, but continued to serve myself, never truly taking that ownership of a personal relationship with Jesus. I had in my head that I could do whatever I wanted and God would still forgive me. My search for love and the feeling of being accepted, went on for many years. I was continually searching for someone to love me and make me feel complete. Yet, I still did not even love myself and found myself being self destructive. I was looking for love in all of the wrong places, especially in relationships that were similar to my childhood upbringing. For many years, I attended secular counseling sessions for the abuse I endured, but more often than not I would come home feeling worse than when I arrived. The feelings I had never went away. I continued to look for someone to fill that empty place in my heart. I wanted to feel loved and important to someone. In the 1990's, I worked with a woman who was heavily involved in self help and the new age movement, so I began reading many books and listened to tapes and even went to seminars on such subjects. I was continually searching for something or someone to make me feel whole, complete, loved and forgiven. During that time, I met my husband, Adam. He was a loving, gentle man…completely different from anyone I had dated before. I was still carrying the battle scars of my past, so we were in a constant battle of me drawing him nearer, because I wanted someone to love me, yet holding him at an arms length, never allowing him to get too close for fear of being hurt again. After months of telephone calls and written correspondence, we received a phone call on Feb. 13 that Ariel would be coming on Feb. 16. Which meant Adam and I had three days to prepare emotionally and materially for a 4 year-old child. When Ariel arrived she came with one bag filled with one outfit that didn’t fit and an old battered looking doll. There was a sadness and a fear in her eyes, the comments that she made and the behavior qualities she portrayed, indeed confirmed in my mind that I was saving her. In the months that followed, we started attending the church where my mom attended on Sundays. I adjusted my work schedule to be able to take Ariel to daycare and to be able to attend all of the counseling sessions and the Dept. of Social Services appointments. We had a multitude of people coming through the house examining our character and past, our parenting skills and every area of life. Through all of this, the Lord slowly opened my eyes to my character. You see, I had several nieces and nephews whom I had watched grow in earlier years. I observed my families parenting style and their children’s behavior and in the past would always say “my children aren’t going to behave like that!” Well, here I was faced with a new challenge. I had a four year old walking around, a mirror image of myself…everything I said, she said…with the same attitude and it was not complimentary. The Lord began pointing out to me how lost I was without Him. I felt overwhelmed with all of the legalities of a pending foster-care verses adoption, the anger my sister had for us, the appointments we had to keep, working full time, keeping the house and all of a sudden the time investment you have when raising a child. Most of all, God pointed out to me, that HE knew everything about me, every bad thing that I had done and He still loved me. HE loved me so much that as John 3:16 states For GOD so loved the world, He gave His One and only Son, that whosoever shall call upon Him shall be saved. I knew I couldn’t do it on my own. I needed Him as the example of how to live a godly life and I needed His Word to show me how to be a godly wife and mother. God pointed out to me that by taking Ariel in, I was not going to earn my way to Heaven. In Romans 3:23 it says, "For ALL have sinned and fall short of the glory of God. " He made it abundantly clear that He placed Ariel in our lives not for me to be a tool in saving her from an abusive childhood, but in His ALL knowing power, He used Ariel to “save” me by bringing me to the knowledge that I needed a personal relationship with Him. 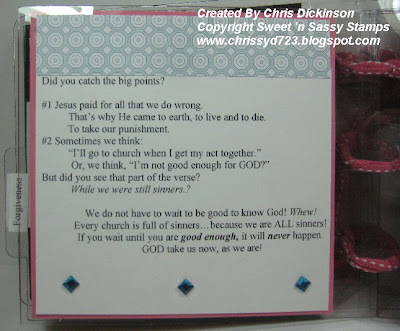 In Romans 6:23 it says, "For the wages of sin is death, but the gift of God is eternal life in Christ Jesus our Lord." 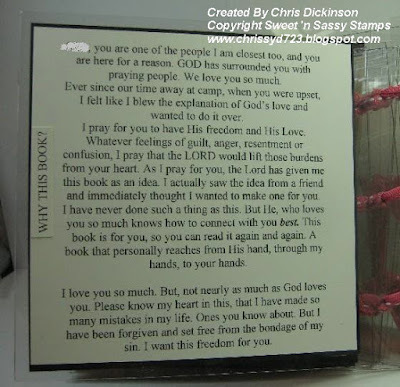 In the early summer months of 1996, I accepted God’s free gift of salvation for eternal life. I can say with confidence I have eternal life and I know that when I die, I am going to Heaven. In Ephesians 2:8-9 it says, "For by grace you have been saved through faith and that not of yourselves; it is the gift of God, not of works lest anyone should boast. " On December 30, 1997 through God’s grace, the adoption of Ariel was complete. I did not save her. God placed her in our lives and gave us the blessing to raise her in our home and to be her parents. Come back to join us in the SCRIPTURE BLOG HOP tomorrow. 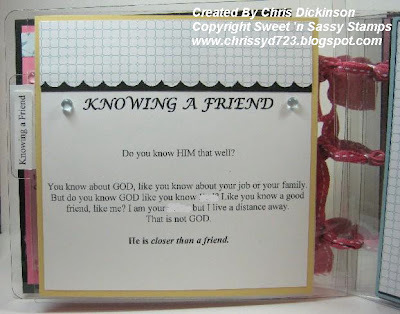 SWEET 'N SASSY STAMPS BLOG HOP! Good Day!!! 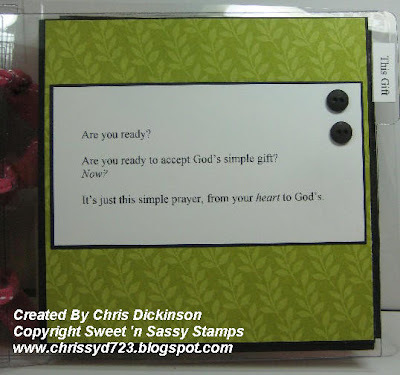 Today is the beginning of this week's Sweet 'n Sassy Stamps Blog Hop! Come join us in the fun!!!! Good Day! 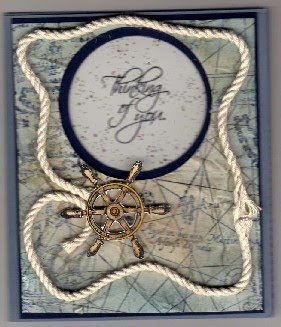 Todays card uses the TECHNIQUE JUNKIES technique FAUX SANDING! 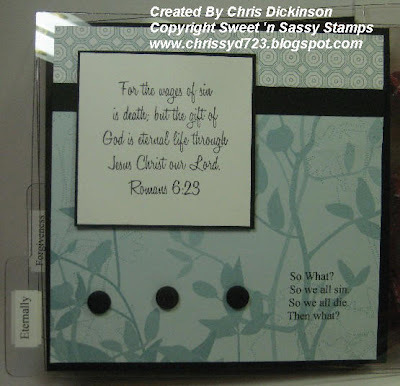 I used the stamp set IN HIS TIME available at Sweet 'n Sassy Stamps. This was such a FUN and EASY technique! 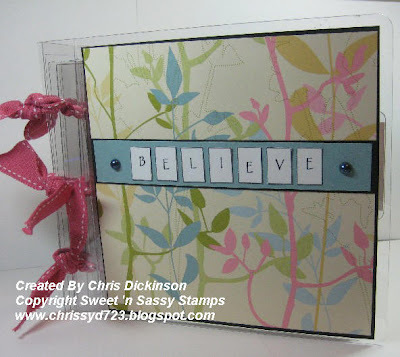 This week, join us for the Sweet 'n Sassy Stamps monthly DT Blog Hop! 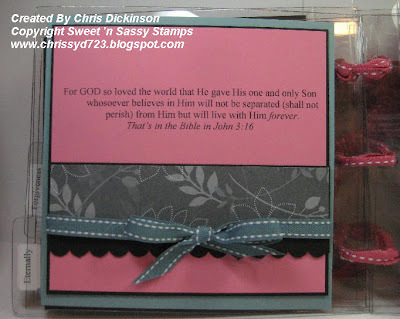 This month we are featuring our popular scripture stamps! Good Mornin'! The coffee must be working today, because I feel like I could SAY a million things! :) I slept good, I am so thankful for a wonderful day. I had an evening with NO meetings and NO errands and NO place to go...Ahh Home Sweet Home. I must be getting old now because honestly I rather stay home than be running all over creation...(ok, now I know I am getting old, my mom says that! LOL) With Vacation Bible School behind me, this coming week is going to prove to be MUCH quieter! Ahhhh... Lots to do yet to prepare for school to start, but I will still be home! Today is Sweet Stop Sketch Saturday! The sketch is below my card here. We hope you can play along. 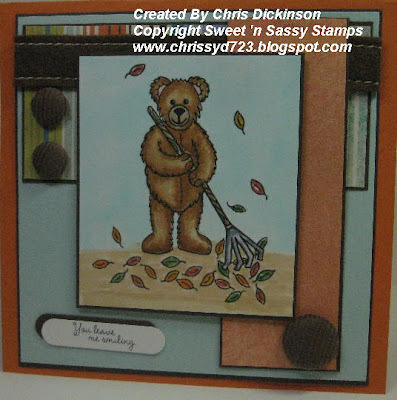 The image I used for this card is the ADORABLE Leave Me Smilin' Digi Image available at Sweet 'n Sassy Stamps! 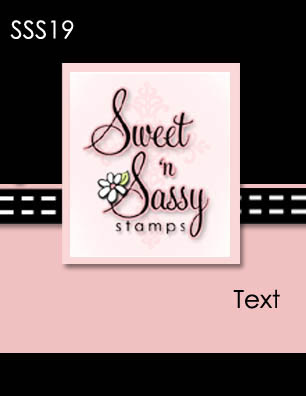 Sweet 'n Sassy Stamps has a wide variety of images available for every occassion! Check it out!!! We will be going to a Murder Mystery Dinner tonight hosted at some friend's house! It will be LOTS of fun!!! My character is going to be Barby Q, the dazzling blond divorcee who's got it all: an IQ of 140, an itsy bitzy teenie weenie yellow polka dot bikini and heartaches by the number. My husband who is NOT excited about this at all will be Spudnik, a Russian rocket scientist who recently defected to America. He has high hopes of becoming a successful American capitalist. I hope you have a GREAT DAY!!!! Thank you for stopping by! HAPPY FRIDAY!!! This week, I have been busy with Vacation Bible School, teaching the kindergarteners. I have had a BLAST, but man do they take the energy out of me. Todays Bloggers Challenge is to showcase punches and this Technique Junkies technique works perfectly for the product showcase! 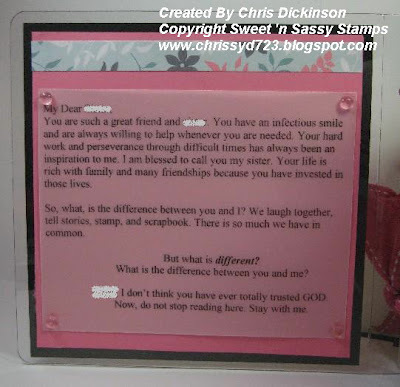 I used ALL STAMPIN' UP! products on this project! Be sure to stop by and visit the other Bloggers Challenge Players, I'm sure you'll be inspired by their creations! BELLI CHALLENGE - HAPPY SCARECROW! Hello! Today is BELLI CHALLENGE day! I am so glad that you stopped by! This weeks challenge is to use water based markers...NO Copics! I really struggled with this card because I have grown attached and used to my Copics! 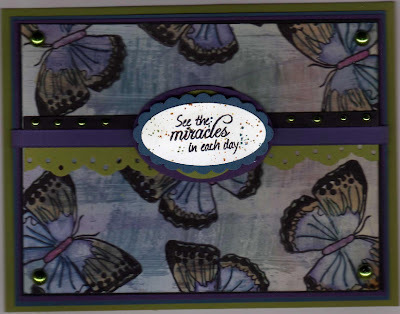 :) Kathy from Peachy Keen Stamps is very generous and is our sponsor for this weeks challenge. Thanks Kathy! Their stamp line has perfect images for coloring. A winner who will receive a Peachy Keen stamp will be chosen by using Random.org and will be posted before the next challenge. The images we used are Natalee (PK-210), Happy Scarecrow (PK-613) and Sleeping Teddy (PK-250). 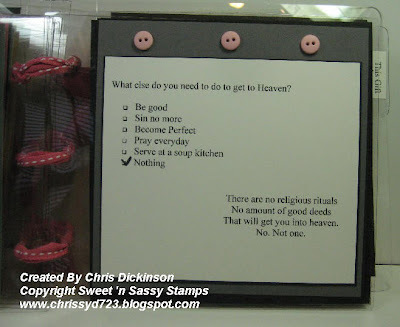 If you haven't been over to Peachy Keen Stamps to check them out you need to! To play along with us create a card or project using only WATER BASED MARKERS ~ NO COPICS!, We can't wait to see what you come up with. If you post to SCS or PCP or any other online gallery please use keyword CBC72 so we can find it. 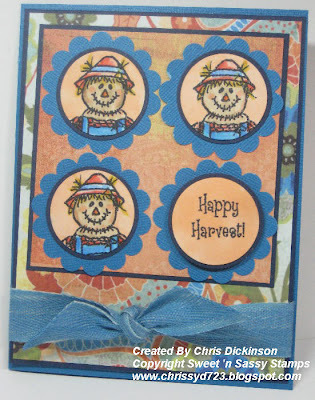 This card uses the Happy Scarecrow. I watercolored him with the markers - It was so much fun, but man am I rusty after working with the Copics the past year. We would love for you to join us in the challenge! Follow the link above to see MORE of our FABULOUS Design Teams work! Hello! I am making a QUICK post before I head off to Vacation Bible School! I am teaching the Kindergarteners this year. It should be LOTS of fun. I have not taught the past several years in VBS, so this year, I was led to do some more teaching. Yesterday was our first day and it went well. 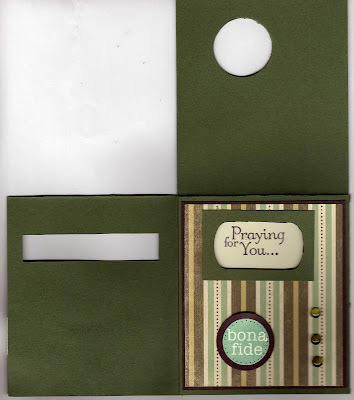 This project features a card using the TECHNIQUE JUNKIES technique Tri-Window Fold over from the August newsletter. 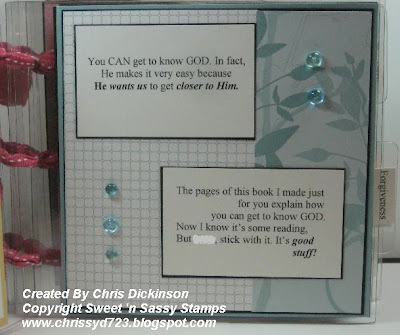 It was so fun to create this card and think about which punches I would use or figure out what shapes and images to put in the windows. FUN, FUN! To get this aged look on the top picture, I first stamped the background, then I wadded the paper up in a ball. 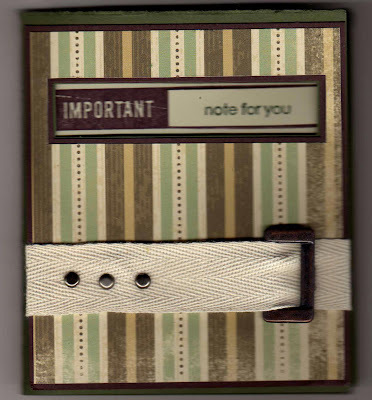 Unwrapped the cardstock and sponged it with both Night of Navy and Creamy Caramel cardstock. 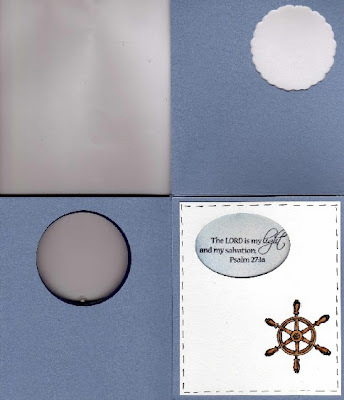 The stamps I used were OLd World Map, All in a Row and Ships Ahoy from SU, all retired. 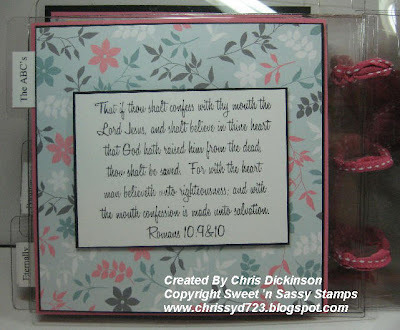 I also used Light of the World by Sweet 'n Sassy Stamps. I colored the Lighthouse image with my Copics! 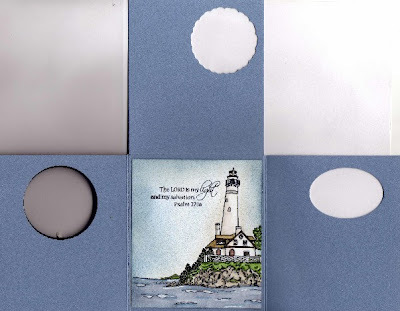 Cardstock: Bordering Blue, Whisper White, Night of Navy. Well, I am off for another day of fun at Vacation Bible School. Tomorrow is Belli Challenge Day! Come join us in the fun! Have a great day! It is Saturday! This morning we are heading to the farmers market and then the beach for a few hours, then I am planning on coming home to STAMP! We have lived one mile from Lake Michigan for over 10 years and just this summer discovered the beach thanks to some friends sharing some pictures on Facebook. Today is the SWEET STOP SKETCH! Have you played yet? These sketches are so fun and easy to create with if you are new to the whole sketch idea. For those addicted to sketches, these are great sketches to create quick cards with great WOW factor. You can find out about the Sweet Stop Sketches, HERE. This week the sketch has a TWIST - use a Back to School or Fall set. 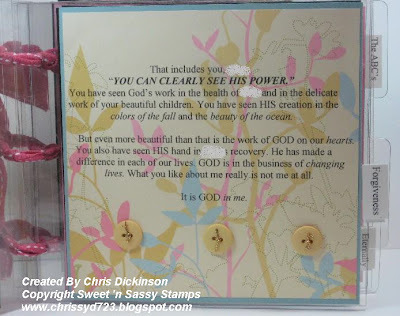 CREATIVE CUTS AND MORE BLOG HOP TOMORROW!